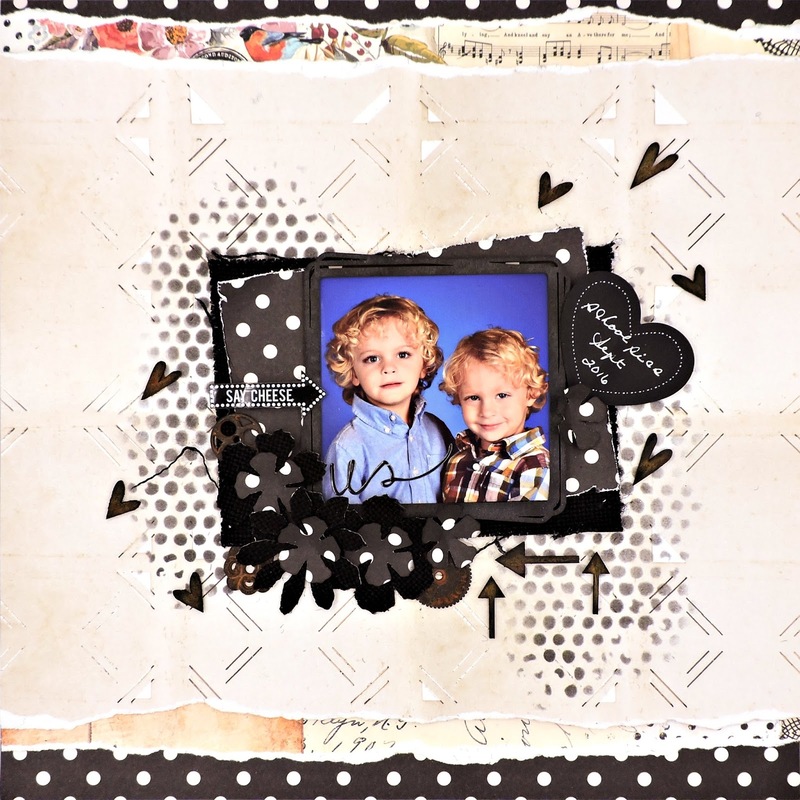 This layout was created mainly from the October Rose Garden Kit from Swirlydoos that features not only the Prima Rossibelle collection of pattern papers, but a wonderful variety of coordinated embellishments. I thought I'd try the torn paper layering that's so popular right now, and I do like the results. First, I cut an eight inch square from the Pebbles Basic Black Dot paper and put it aside for later. Then I tore strips from the top and bottom of the Prima Rossibelle Vintage Memories sheet. After adhering large piece to the center of the bottom paper, I tucked the reverse side of the strips underneath. When that was done, I used the Tim Holtz Bubble stencil and Ranger Distress Ink in Black Soot to add a little more texture to the background. I adhered some of the leftover Black Dot paper to the black burlap sheet from the kit with Score Tape before cutting out some flowers with a few Sizzix Tim Holtz dies - Movers and Shapers Tattered Florals Set and Bigz Tattered Florals. The smallest shape was cut from the Black Dot paper alone. The Studio Calico Hearts & Arrows wood icons were colored with Black Soot Distress Ink, then painted with watered-down Prima Rust Paste. I used the brown, slightly dried that with my heat tool, then applied the red. I'm still trying to make a dent in my chippie hoard and I found this perfect piece - a frame that Rae Moses gave me a few months ago. I simply treated it with the same Distress Ink and adhered it to my photo. And now it was time to assemble my page. I glued the last of my Black Dot paper to a slightly larger piece of the black burlap on a slant and adhered it to my base. Next, I taped a bit of packaging to the back of the photo to give it some lift and placed it slightly off center. I wrote on one of the chalkboard hearts that came in the kit and glued it on the side. Next, I placed the die cut flowers around the photo, tucking in some Finnabair Rusted Gears from my stash. The arrow and the lettering on the photo are both epoxy stickers from Heidi Swapp. To finish my page, I scattered the hearts and arrows around until I got the effect that I wanted. Love it! They are just adorable!